President Trump's get-tough approach to Iran could kill a huge energy investment signed just four months ago. Under the deal, Total (TOT) and China's CNPC agreed to invest billions of dollars in Iran to develop the giant South Pars gas field in partnership with Iran's Petropars. It was the first investment of its kind since sanctions on Iran were relaxed in 2016 after Tehran promised to roll back its nuclear program. Trump has threatened to quit the nuclear deal if the U.S. Congress and America's allies fail to strengthen it. "Either we can do the deal legally if there is a legal framework," Total CEO Patrick Pouyanné told CNNMoney Emerging Markets Editor John Defterios. "If we cannot do that for legal reasons, because of [a] change of [the] regime of sanctions, then we have to revisit it." Trump unveiled a tough and comprehensive new policy towards Iran last month. He accused Tehran of violating the nuclear accord, and announced that he would no longer certify that the lifting of sanctions was in U.S. interests. The agreement is now effectively in limbo while Congress decides how to respond, but Trump's strategy risks setting off a chain of events that ends up derailing the nuclear deal. 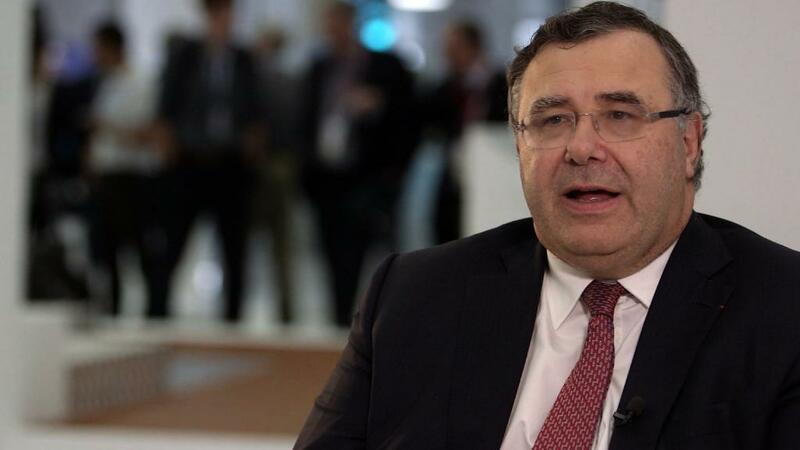 Total is expanding in the U.S.
"If there is a sanctions regime [on Iran], we have to look at it carefully," said Pouyanné. "We work in the U.S., we have assets in the U.S., we just acquired more assets in the U.S."
Total last week increased its U.S. presence with the purchase of a portfolio of liquified natural gas assets from Engie (ENGIY), including the company's stake in the Cameron LNG project in Louisiana, one of the first new gas export terminals in North America. That deal ups the stakes for the French firm. For now, though, it's business as usual in Iran. "We are working on the project. We launched the tenders, we should award... contracts by January," Pouyanné said. "I hope by that time, Congress will have an answer for the president and the president will have to renew, or not [renew], the certification." Losing Total would be a huge blow for Iran. Tehran needs foreign investment to develop its vast energy potential and it was recently touting projects worth $200 billion in the hope of attracting companies such as BP (BP), Russia's Gazprom (GZPFY) and Petronas of Malaysia.